Edited to add: Blogger is messing with me! This was scheduled to go live earlier today and it didn't post. Grrrr. This is a tag for a Christmas gift, believe it or not. Instead of doing it as a typical tag shape, I did it as a mini card style. This is about 2.75 inches 'square.' The inside has the typical "To: From:" so that the receiver of the gift can be identified. The image was the August digi for the monthly progressive challenge at From the Heart. I played in that challenge for a month or so last winter, I think, and then kind of fell off and didn't do it for a while. I'm starting up again, and I promise that I'll be better at playing each month. 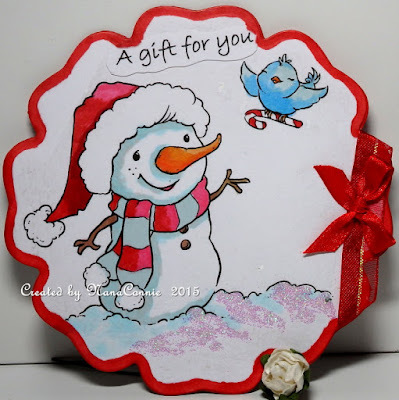 The image is colored with ProMarkers and I added loose glitter to the snow on the ground. I cut the shape for the mini card with a die from Spellbinders. The ribbon came from Really Reasonable Ribbon and the little bow was tied using my bow maker. It's a simple tag so there's not much else to say but I do love that cute image. 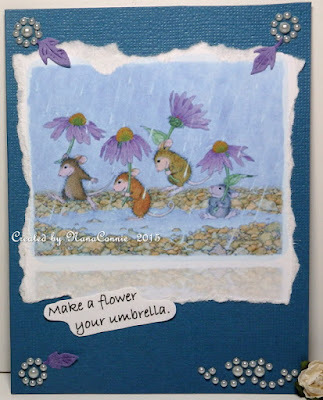 I've done a set of simple note cards using new coffee mug designs from Paola at My Whimsical Little World. She's also working on a set of Tea Cups and I plan to grab those as soon as they hit her shop for another set of note cards. I've done 3 of each design for a set of 9 cards and I'll probably use them as gifts during the holidays. Two of the mugs are paper pieced and the third is colored with Copics. Copics were also used to color the coffee and the donut on the paper pieced designs. I used the same dp from the paper piecing to frame the images. Because these took some time to color and piece, and because they probably will have to go in the mail when used, I left them very CAS - no embellishments at all. A quick bit of background for this card: I played in one of the games at Dragon's Lair FB page this past week and was one of the players who won a freebie image (of my choice.) Dragon's Lair used to be Stamping with the Dragon and I have many of their darling dragon images. But this time I fell in love with this glorious "Winter Beauty" digi the instant I saw her. I got her this morning and immediately started planning a hugely fancy or vintage card with the image done in lots of sparkle and shimmer and glimmer and embellishments all over. Then I printed her and started coloring and suddenly I knew this had to be a totally one-layer, CAS card with the image done as simply as possible. Is it OK if I start this post by saying that I LOVE THIS CARD! ? This is one of those that just came together after I made my list of more than a dozen challenges I wanted to enter (not counting A/G challenges.) 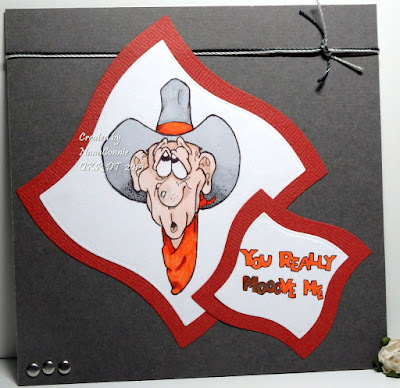 The list included themes like fancy folds, vintage, pockets, die cuts, lace, layers, flowers, sentiments, animals... you get the idea. Most of the time, when my list of challenge themes is that long, the card is finished long before I get all the challenges included and I end up eliminating some of them. Not this time! I used them all and I think they really worked. The card is made from a piece 12 x 5.5 inches, cut on angles from the top to the outer corners, then folded to make the front flaps cross. The bottom is sealed to make a pocket and the image piece slips into the pocket. Here's a close-up of the image piece. I wish I knew what I did differently in photographing this time so that my purples stayed purple. Well, come to think of it, I used red violets and now they look purple and lavender. :-D Maybe that's the secret -- use red-violet instead of purple to get purple in the photographs. When I use purples, they turn blue in the photographs. 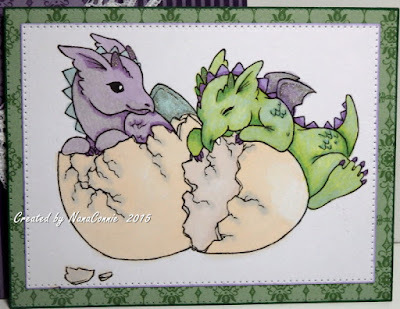 I've used this image at least twice in the two years I've had it but this time I colored the dragons ("Dragon Babies" from AuroraWings) with ProMarkers, adding glitter to their wings before I cut them with one of my new Pinpoint Rectangle dies from Memory Box (Scrapy Land purchase.) The mat is also cut with another die from that set. All the papers are from Stampin' Up (old and from my stash) and I think the lace came from one of my local craft stores, but it's been in my stash for so long that I really can't remember. The gem swirl has been in my stash for well over a year and the butterfly was cut with a die from Cheery Lynn. I had cut that as an extra several months ago and put it into a drawer full of die cut bits and pieces. It worked perfectly on this card, so I dug it out, colored the body, and added glitter to the wings and body. The small flowers are punched (Fiskars punch), colored, layered, and added on top of the lace. The sentiment is printed, hand cut, and edged with a marker. Out here on the West Coast, in California, Oregon, and Washington, most of you know we've had a 4-year drought and are suffering the effects of raging wildfires, though about 25% of those are now out or under control. Still, we are hoping for an El Nino fall and winter which will bring water to the parched land. So, what does all that have to do with today's card? This is what most of us out here feel like, waiting for one little drop of water, for the opportunity to quench our thirsts. LOL On the other hand, that one drop is a huge mouthful of water for that tiny mouse so maybe it's all how you view it. In any case, how could I resist an adorable little mousie like this one? I think this is Monica (from House Mouse) but they do tend to all look alike so who really knows? inspiration photo at Sketchy Colors. 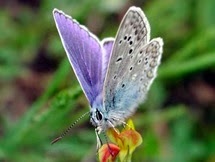 Unfortunately, all my lilac/purple tones turned blue in the photograph. 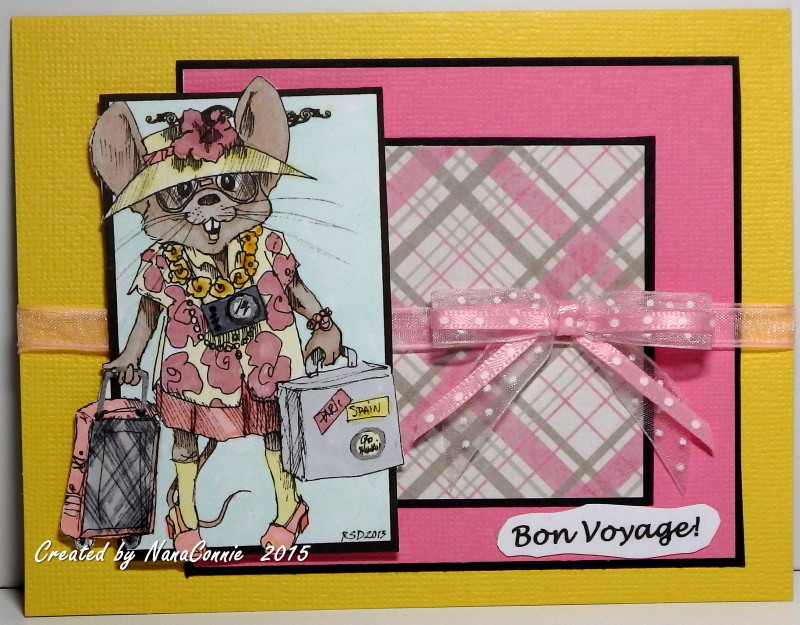 House Mouse image colored with ProMarkers and chalk markers, papers from Stampin' Up, and ribbon from Really Reasonable Ribbon. I have started collecting images from a new artist -- well, new to me at least. A Teamie friend of mine was kind enough to add me as a member of the FB page for MHK Designs and that started my love affair with these new digis. I went on a shopping spree after Mynn's newest release and this is the first time I've been able to use one of them. It's called "Animal Friends" and it's the main image in the "Friendship" set. The sentiment is from the "Beauty" set. I used my ProMarkers to color the image, then cut it with a rectangle die from Spellbinders. 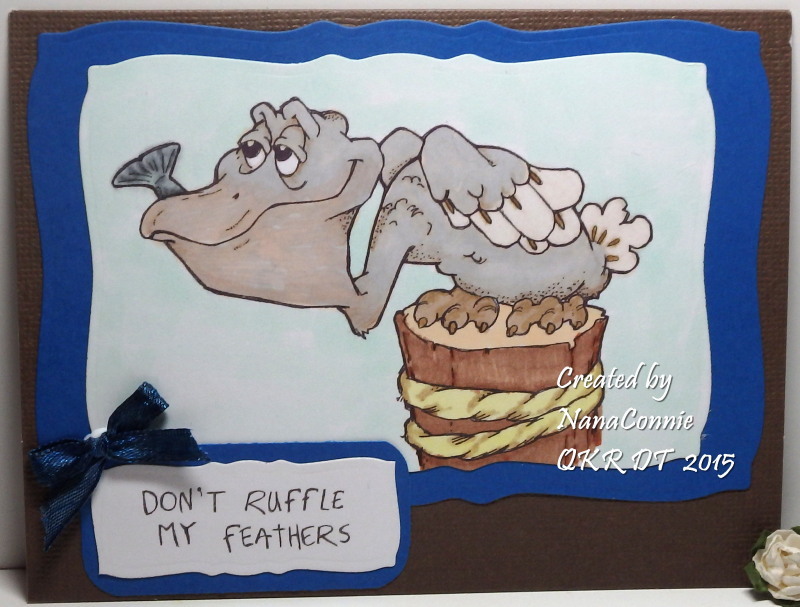 I matted that with dark brown CS and added brown ribbon at the top. The bow I hand-tied using my bow maker and that ribbon is from Really Reasonable Ribbon. I kept it pretty CAS because this card is going to the father of a friend who asked for a card that had animals on it. They live on a farm and have a whole passel of farm cats in the barnyard. 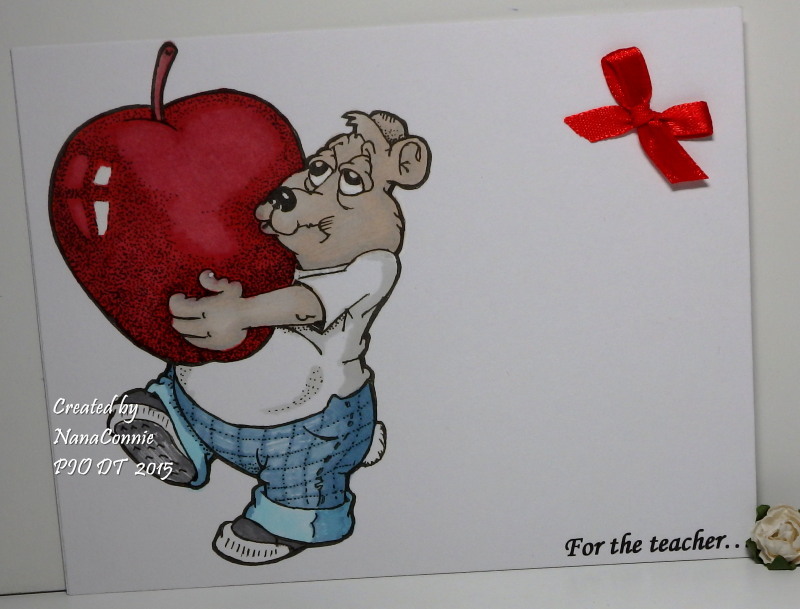 Just in case the post title made you think you'd see something from or about New York -- nope, we're talking real apples, the kind a kid takes to his teacher. At Pile It On this fortnight, our challenge theme is "Animals Dressed Up" and our fabulous sponsor is QKR Stampede, where you'll find dozens of cute images of animals in human clothing. 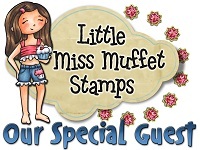 I happen to adore QKR images, and they have both rubber stamps and digis. This one is a digi called, appropriately enough, "Big Apple." Go find a "dressed up animal" image and then come play in our challenge. My daughter actually requested a card that would go along with a gift basket of classroom supplies she's donating to my youngest grandson's school. I did a super CAS, single-layer design, and the image is hand-colored with ProMarkers. The only embellishment is the little red bow. Is everyone in your family already back to school? Or does your school district start after Labor Day? When I was a kid, we always started on either the Tuesday or Wednesday after Labor Day Monday, which seemed to mark the 'official' end-of-summer, at least for the kids. Of course, we didn't get out of school until the end of the second week in June. My grandkids all start in mid-August now, and get out sometime in May -- always before Memorial Day, in any case. I've been reviewing old stamps and images and I'm amazed at how many I have that remain unused. So, over the next few weeks, I'm going to try to alternate between old and new images. 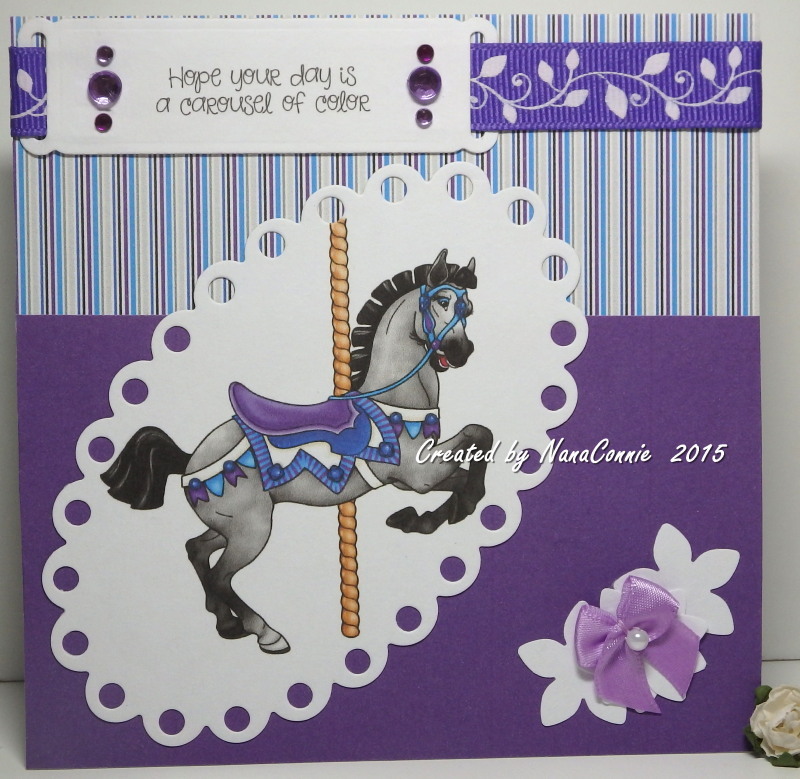 Here's one of my old ones from more than a year ago, a delightful carousel horse from Doodle Pantry. In fact, the sentiment and papers are also from Doodle Pantry and also more than a year old. Another really quick post this morning because I have a "shopping" appointment with my daughter. We're going to look for fabrics to make tablecloths appropriate for the upcoming fall holidays -- Halloween, Thanksgiving, & Christmas. She has a huge dining room table and most of the family dinners end up at their house because they have a table big enough to seat everyone but finding a single tablecloth to cover it means being creative so I'm going to make some for her. Both die cuts are done with dies from Spellbinders. The white flowers are cut with a Fiskars punch. The bow is one I make myself, hand sewn to add the pearl. The purple ribbon is from my stash, as are the gem stones. I'm so tickled about the image I used for the new challenge at QKR Stampede this week. Our theme is "Use Die Cuts." 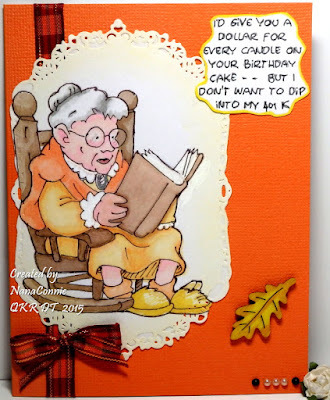 Both my image (Digi 17202 Rocking and Reading) and my sentiment (Digi 22902 Birthday Candles) are from QKR Stampede. I loved the inspiration photo at Shabby Tea Room. I'm convinced that lady in the rocking chair is a retired, first-grade teacher -- can't you just hear her reading aloud to a classroom of 6 year olds? lol Or maybe I just see in her my mother, a grammar school teacher for 37 years before her retirement. In any case, I'm going to send it to another retired school teacher for her birthday, hence the fun, birthday-related sentiment. I used my ProMarkers to color the image, and cut it with a die from Spellbinders. The sentiment is printed, hand cut and inked on the edges. The ribbon has been in my fall stash for more seasons than I care to admit and the pearls just called out to be used here. I added a little twist to my otherwise predictable designing by finding and using that little wooden leaf for another touch of fall and maybe more thoughts of returning to school. I used a ProMarker to color the leaf. Really short post this morning because I forgot to get it scheduled last night, and now I'm running short of time before a meeting I have to attend. Fortunately, this one is pretty self-explanatory. House Mouse image (Flower Power challenge theme); hand-torn paper, pearl swirls and pearl flowers, leaves are die cut. I used the sketch from The Outlawz. Those of us in the West who are surrounded by nearly 100 fires blazing away in the three coastal states are praying for rain and a reason to get out our umbrellas. 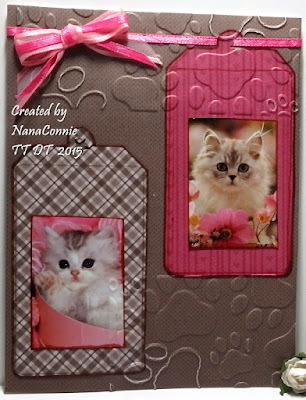 This card is somewhat outside my norm but since it has a couple of precious baby kittens on it, it's not totally outside the scope of my creativity. :-D Tuesday Throwdown has a new challenge starting this morning and our wonderful sponsor is Lawn Fawn. Our theme is "Texture." Let me show you the card first and then I'll give you all the details. Let's start with the Lawn Fawn papers. All the papers on the card are from Lawn Fawn and for the life of me, I can't remember the name of the stack. The baby kitten images are from an old calendar. They were just too cute to throw out so I saved them in a scrap box. Two of the papers I die cut with one of my tag dies. 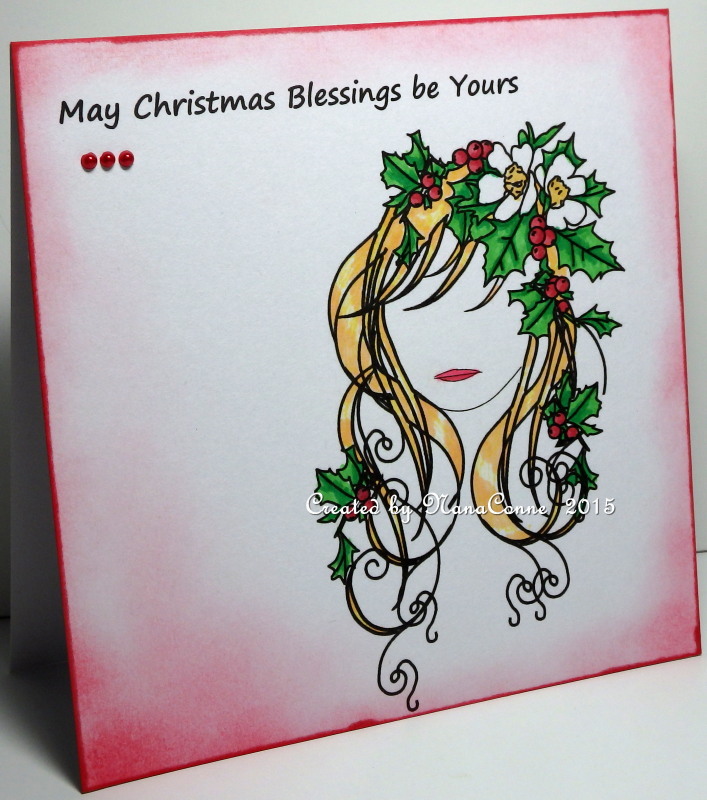 I think this is the first time I've ever used tags on a card and I rarely make tags except for the holidays and occasionally (very occasionally!) for a birthday gift. I edged the tags with distress inks to match the edges of the images. The background paper with the teeny-tiny polka dots was neutral enough to showcase the papers used for the tags. 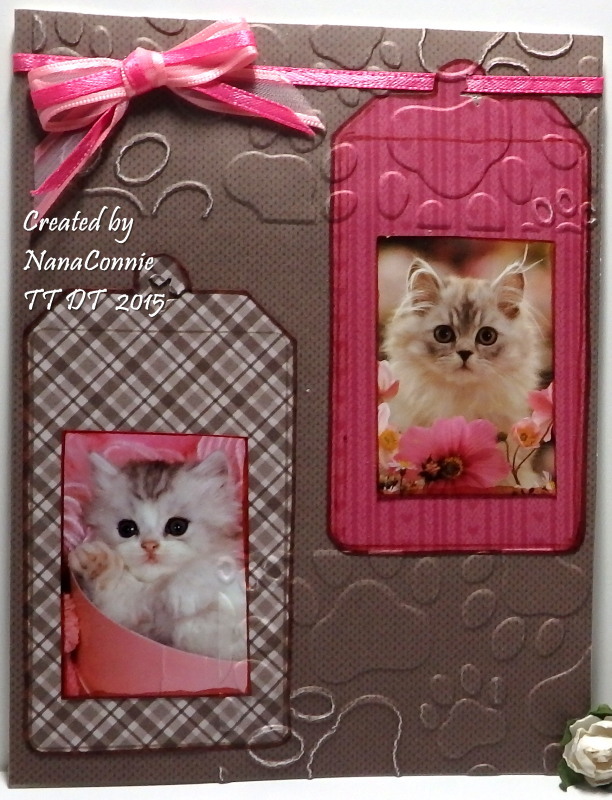 After I had adhered the tags to the background paper and the card front, I used a pawprint embossing folder and embossed the top and bottom, leaving the middle plain. I distressed a couple of spots on the pawprints with an emory board to enhance the look. Since the embossing goes all the way through the card front, it gave the card some nice texture. I'm a member of The Outlawz and I love playing in all their weekly challenges but my favorite one is the Progressive Challenge which runs for an entire month. Once you sign up and get the image, for each month you play you'll get another freebie for the next month. 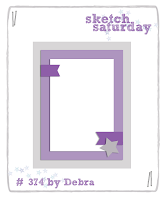 This month the freebie was provided by Make It Crafty and she's so adorable! where they want us to use at least one of the colors. I used my ProMarkers to color that sweet little girl, then cut her with a die from Spellbinders. I did add some glitter to the dragonfly wings and the dandelion seeds but it's nearly impossible to see in the photo. The doily is from my stash; the ribbon is from Really Reasonable Ribbon; the butterflies are die cuts from a die by Cheery Lynn, and I'm entering their challenge to 'use doilies.' I added glitter to their bodies for some additional sparkle and glitz. 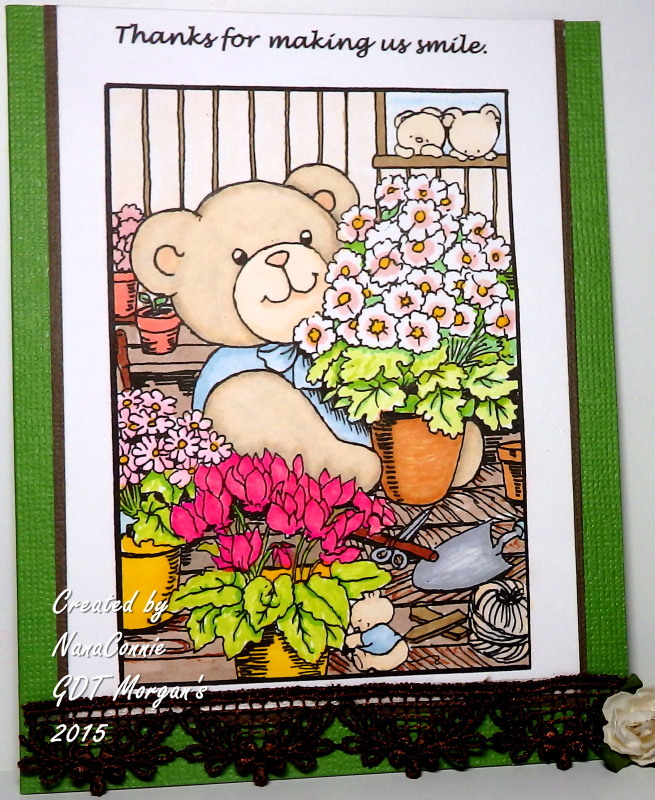 Today's post is just a reminder that you still have a couple of weeks to make a card and get it posted using the August Digi of the Month from Deedee's Digis. It's called "Seasonal Baskets" and has images for each of the seasons. See the bottom of my post for a photo of the complete set. Remember, this is a progressive challenge. If you use the image this month, you'll get the one for next month as a freebie. But this month is a bit different. If you've never played at Deedee's before, or if you couldn't play for a month or two so weren't getting the freebies any more, you can get back into the challenge by using the freebie Christmas basket from the set which Deedee is giving away on the challenge blog. Just click here, then scroll down and grab the freebie to play. 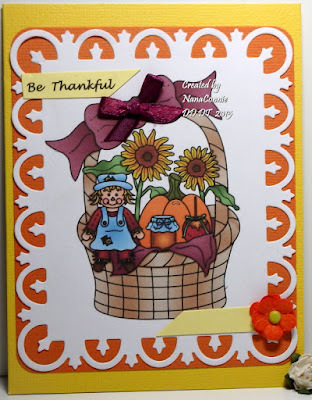 I used the autumn basket and made my first Thanksgiving card for the year. I based this on the sketch from Sketch Saturday. 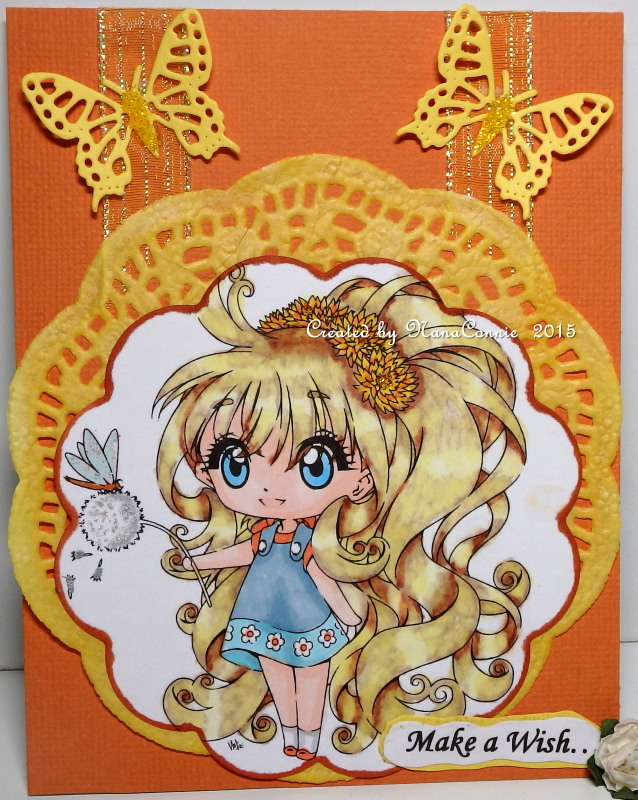 This time, I used one of the pre-colored images, die cut it with one of my dies from Spellbinders, and mounted that onto pumpkin orange CS from the AC Cardstock Earth Tones collection. I used a punch to round the corners. Everything was adhered to a goldenrod, pre-made, card base. It was time to combine my two favorite embellishments -- bows and flowers. 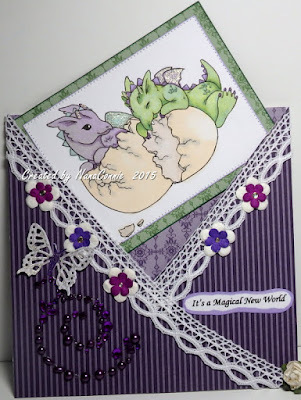 I love both of those because I can make them as large or as small as I want, depending on the card design. I can also get whatever color I want by starting with white and using markers to dye them. I tied a bow from (originally) white ribbon which I dyed with a ProMarker and added it to the bow in the image. The orange flower (also dyed with a ProMarker) was made with three layers of flower petals (Recollections), held together with a brad. Overall, another CAS design which looks much fancier than it is because of the die cut frame. Included are both pre-colored and outline versions. I know, I know, everybody thinks of owls as being for fall harvest or Halloween but I want you to know that these three little owls are sending a message about the Christmas season, especially concerning all those presents hidden away in the hallway closet. 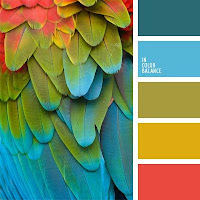 :-D The image is from AuroraWings, where their challenge theme is "Anything with Wings." Isn't it adorable? I used ProMarkers to color the image, then bordered it with white paper and matted it with dp from Recollections. I added two other dp (also Recollections) and did the faux stitching (or doodling, depending on how you see it) with a white gel pen. I love the tiny polka dots! The three pearls came from my stash. How's this for a CAS design even though it has 3 different papers and 4 layers? We have a new challenge starting today at QKR Stampede and our theme is "Day at the Beach." I used this image and this sentiment from QKR: Digi 18511 "Happy Pelican" and Digi 15103 "Ruffle Feathers". 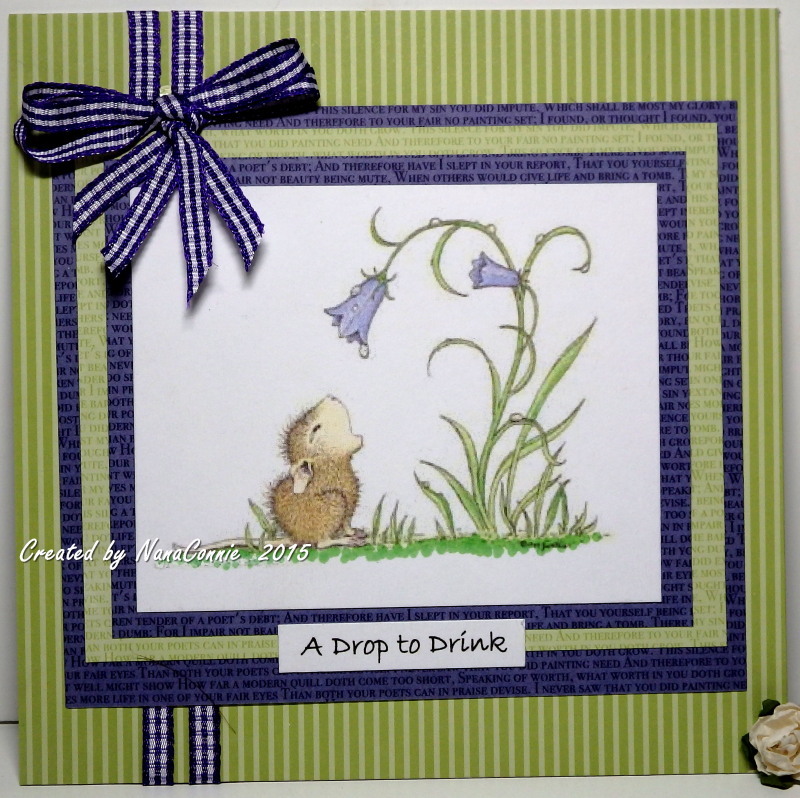 The image is colored with my ProMarkers, then die cut with a die from Spellbinders. Another larger die from that same set was used to cut the mat piece. I used the smallest die from that set to cut the sentiment but I had to adjust it, cutting the top first and then sliding the die up to cut the bottom because it was larger than I wanted. 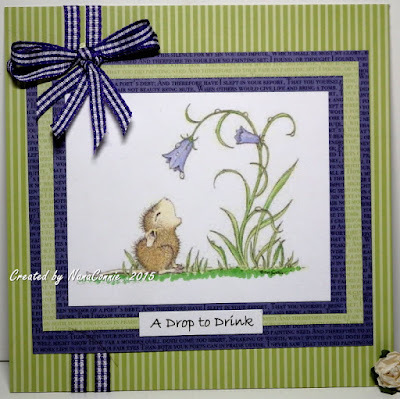 I used the same blue CS (but hand cut it) to mat the sentiment. The small blue bow was hand tied. 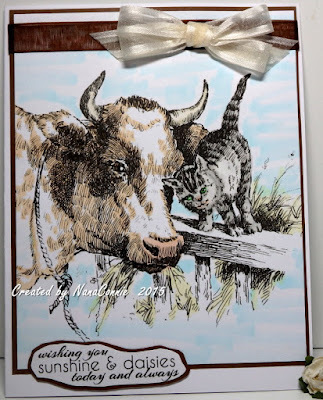 Everything went onto brown CS embossed with my "Linen" folder and then onto the card front. A couple of weeks ago, I was invited to be a Guest Designer for Morgan's ArtWorld and I jumped at the chance. The challenge theme this time is "Beachy or Summery." 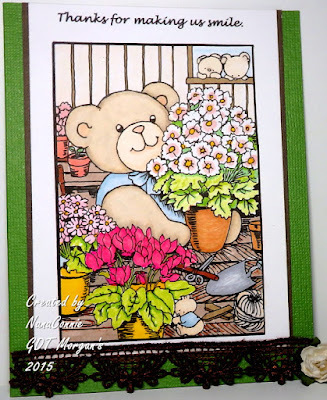 This darling little teddy bear (Teddy 11), working in his potting shed, looked so perfect for a summer card. Isn't he sweet? Don't you wish you had such gorgeous blooms in your summer garden? 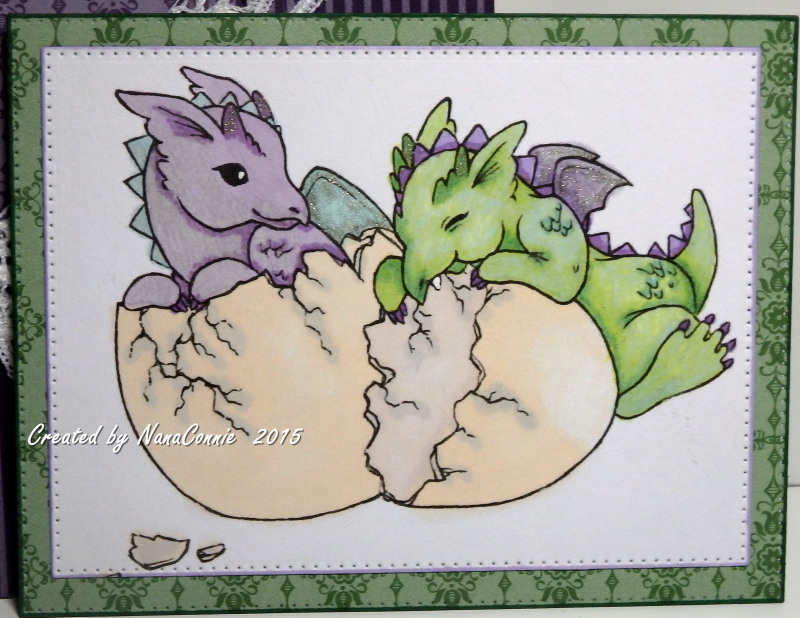 I colored the image with my ProMarkers, then die cut it with one of my plain rectangle dies from Spellbinders. I matted it first with white CS (with the sentiment on it), then with dark brown CS and layered those onto a green card base. The brown lace was in my stash and it probably came from Joann Crafts or maybe Beverly's. It's not nearly as dark as it looks in the photo; in fact, much closer to the brown CS color. 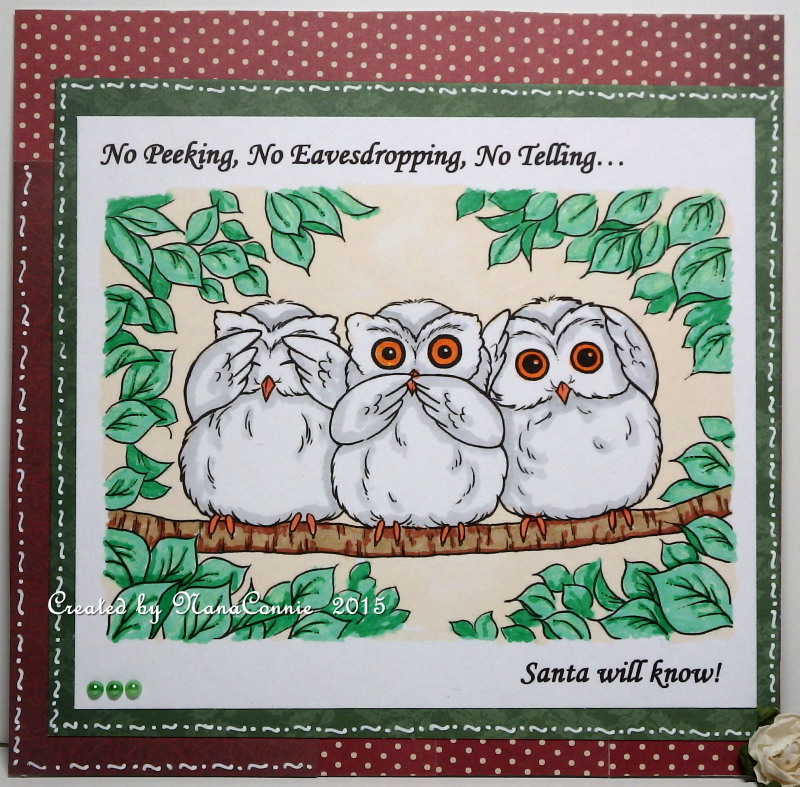 OK, ok, I know the whole "Christmas in July" thing is over now that it's August but since our challenge theme at QKR Stampede this week is "Anything Goes," and since I adore this image, it just seemed a good day to add one more Christmas card to my stash. 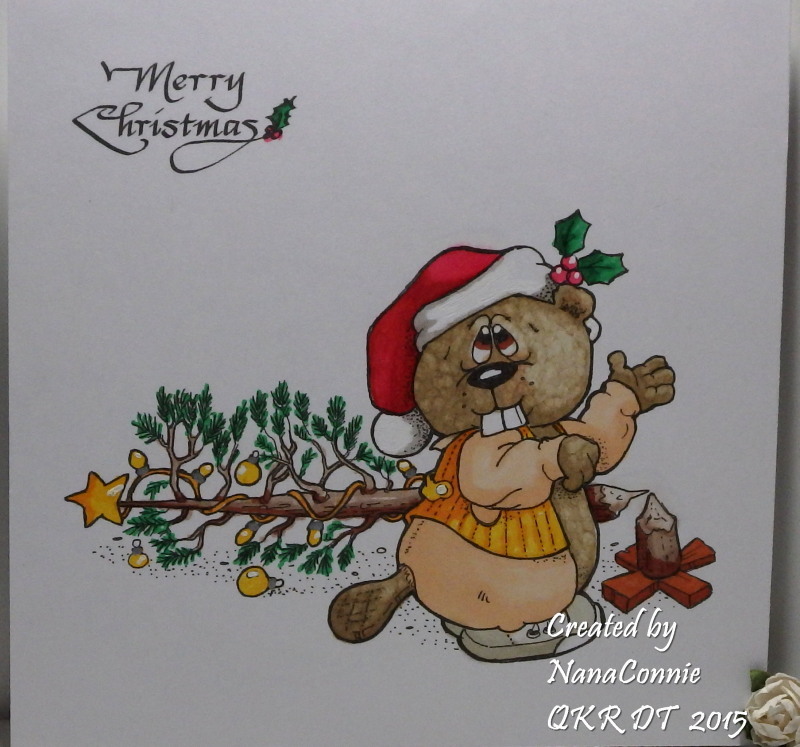 I used both an image (Digi 9802 "Fresh Cut Tree") and a sentiment (Digi 8717 "Merry Christmas") from QKR Stampede on this card. I knew I wanted an absolutely CAS card this time so I printed both the sentiment and the image onto what would become the card front, then cut the card to size (5.5 x 5.5), and colored it with my ProMarkers. That was it -- no embellishment of any kind; no ribbon, no bows, no washi tape, no brads or bling. And you know what? I love it! I think this is the first time I've done a single layer with absolutely NO embellishment of any kind. Look what I did last night! Too many "vacation" days without crafting and I begin to twitch. 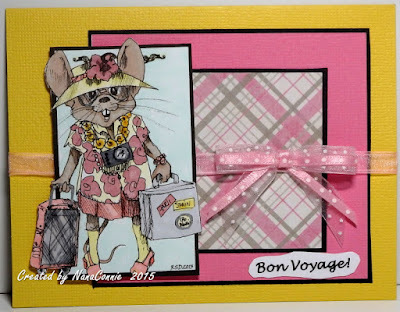 :-D I used this darling little traveling mouse from Rick St. Dennis. It's the image we got for playing in Part 1 of the Progressive Challenge over there last month. This is Part 2, using the image. I colored the image with my ProMarkers and then hand cut it for that out-of-the-box look. The really fun part is that all the papers, including the black CS for the matting, were scrap pieces. Even the two ribbons were scraps. That's what I had with me so... Because I had those scraps, I had decided on a pink color palette for the image but then discovered I only had yellow and blue card bases and everything looked better on the yellow than the blue. The image is popped up on dimensional dots.